I have had a numerous amount of emails lately inquiring how this whole E-design thing works. I can tell you this, that it is going to be different from one designer to the next. I thought it would be fun to give you a bit of an in on how I do this thing called E-design. It starts with a simple email to me where we discuss the project you have in mind. I have a form that is linked at the bottom of my services page that I have you fill out. This covers some of the business necessities as well as a place for you to tell me more about you, your style and your inspirations. I don’t mind hearing about your love of your dog or wine in this part of the form either, it really gives me a sense of you. On this form there is a place to upload photos of your space, you can feel free to do that or just attach them to our email chain, that’s fine too. As long as I get lots and lots of images of your current space, I’m happy. My advice for whether you decide to hire me or another designer; be sure to send us good photos. I am not saying professional by any means and the lighting doesn’t even have to be that good, what I’m saying is try not to send me a photo of the middle of a wall. I’ve received that kind of photo before. It’s not the end of the world, but I will have to come back to you and ask for some more photos. What I always tell clients is, take a look at the images you’ve taken and pretend you don’t live in that home, could you tell what the space looks like? If not, I need more images. You can also feel free to send me a video tour of the space, that’s a great way for me to get a sense of the rooms size too. After the images, comes you taking dimensions of the room. This is also super important because the look of a space through images can be deceiving. Another thing I tell my clients is I need more then just “the room is 12×12,” I actually need the dimensions to the open wall space, the window sizes, the door opening, ceiling height etc. 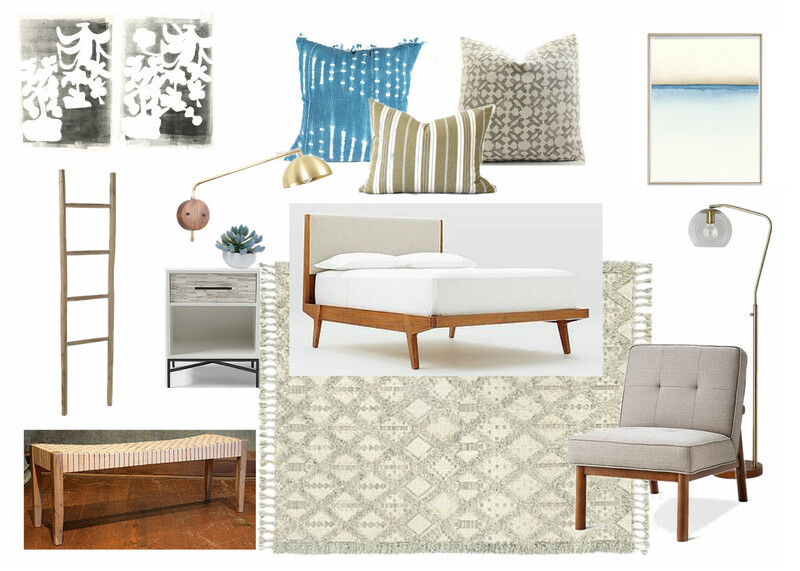 This “homework” as I call it, allows me to create a scaled floor plan that I work off of, guiding me to guide you on the correct art sizes, furniture sizes, rug sizes etc. This allows me to do my best work. When all of this is sent to me, your job is done, woohoo! An invoice is then sent off and now it is my turn, I get to work! You’ll hear from me periodically through the weeks that a design takes to come together, but for the most part you just get to sit back and relax. Once I have finished up your design you will receive a digital main concept board which is what I feature below. I then give you 1-3 more boards depending on the service you chose (full or mini design). These boards may be mock -ups of a certain gallery wall or entry wall that I have designed for your space. They could also be a board featuring comparable items that all have a similar aesthetic, but fall under different price points. I like to give options. Last piece to this process is I write out a written tour of your space. This tour allows you to stand at the door of your room, read my words and know exactly where each item should be place, what sizes you should purchase and my reasoning behind each selection. This is the part I want you all to understand…you can do this! I make it so easy, there’s no guess work involved. As long as you can handle a hammer possibly a drill or at least have someone around that can, then everything I suggest is completely doable. Are you writing only about design? Or maybe also some hi-tech? Maybe you are also interested in making a virtual data room comparison ? thanks in advance for your reply.